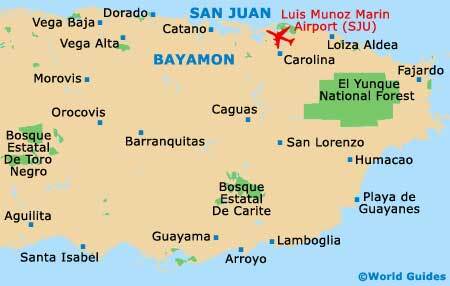 For all intents and purposes, Bayamon is just another suburb of Puerto Rico's sprawling capital San Juan. The two meld seamlessly together, yet Bayamon remains the second-largest city in the country and is home to a small handful of noteworthy tourism attractions. Although not quite as enticing as San Juan itself, Bayamon is known for two things - having the most shopping centres per capita of any city in Puerto Rico and being snarled with some of the country's worst traffic jams. But don't let these statistics deter you from checking it out, especially if you are an avid shopper. The adjacent municipality of Catano is also filled with strip malls, while just a short distance to the north of Bayamon and linked by Highway 870 is the Parque Nacional Isla de Cabras, which offers a peaceful and scenic retreat. Tourist information can be found at an official kiosk when you fly into Luis Munoz Marin International Airport, or alternatively, head to La Castia in nearby Old San Juan. A number of beaches are just a matter of minutes away from Bayamon, offering a different aspect to a Puerto Rican holiday. Particularly lengthy is the Isla Verde Beach, where seafront accommodation comes in the form of modern high-rise hotel complexes. The nearby Condado area and Ocean Park are highly recommended, along with the El Escambron Beach and those around the Isla de Cabras. Pinones is also close by and its beachfront tends to be a little wilder and far less developed than the more popular, more commercial seaside resorts. More information about Bayamon Beaches. San Juan really is where the best tourist attractions live and breathe, with many visitors simply treating Bayamon as a suburb and nothing more than a day trip destination. In Bayamon itself, the extremely impressive Science Park (Luis a Ferré Parque de Ciencias) is what so many people come to see, with its vast grounds comprising an Aerospace Museum, a planetarium, a zoo, a boating lake and a tall observation tower. For a sit down in the sun or an impromptu picnic lunch, the Central Park (Parque Central) is a good place to visit and even offers fun train rides around its perimeter. Under an hour away are a handful of renowned golf courses, and somewhat closer is the Camarero Racetrack, where regular horse racing is watched by large crowds. More information about Bayamon Tourist Attractions. The City Hall is the principal landmark in Bayamon and this highly unusual building is very easy to spot, since it has been built over a busy highway and even features a glass-bottomed walkway. In the adjoining suburb of Catano is the famous Bacardi Rum Factory, where tours include a ferry ride to the actual site, an overview showing the enormous scale of its rum production, and then the chance to sample the drink itself. In Old San Juan, look out for the Quincentennial Plaza and be sure to take a stroll along the seafront esplanade named the Paseo de la Princesa, where you will pass a number of historic colonial sights along the way, that is if you are able to glance away from the endless breathtaking views of the North Atlantic Ocean. More information about Bayamon Landmarks and Monuments. Although Bayamon cannot help but be overshadowed by nearby San Juan when it comes to museums, the city does contain several good choices. The Francisco Oller Museum of Art and History (Museo de Oller) is amongst the best and contains information about renowned Latin American artist Francisco Manuel Oller Cestero, along with examples of his works. At the Dr. Jose Barbosa Museum and Library (Museo Biblioteca Dr. Jose Barbosa), you can learn all about the life of an influential doctor who worked tirelessly to establish a healthcare system in Puerto Rico, while the Caparra Museum (Museo de Caparra) documents the life of Juan Ponce de León y Figueroa, a Spanish explorer who first came to this island just over five centuries ago. More information about Bayamon Museums. If you are staying in Bayamon, then you will certainly want to plan some day trips, so that you can properly understand what Puerto Rico has to offer visiting tourists. Although San Juan will likely come at the top of any list of possible excursions, tourists can also consider outings to the town of Loiza Aldea, the beach resort of Fajardo and the mountain destination of Barranquitas. At roughly an hour away from Bayamon, the El Yunque National Forest provides the opportunity for some serious tropical rainforest hiking. A similar distance away is the Rio Camuy Cave Park and its enormous network of underground caverns, carved out over thousands of years by the Camuy River. In the evening, a visit to either La Parguera or Vieques will reveal the magical and completely natural Bioluminescent Bays. More information about Bayamon Attractions Nearby.